I was an AQF (missile control radar technician) on F4 Phantom IIs for VF-102 along with taking my turn as a Brownshirt (Plane Captain) for awhile. My squadron flew off the USS Enterprise and the USS America. I was aboard the Enterprise for the ’round the world cruise in 1964. 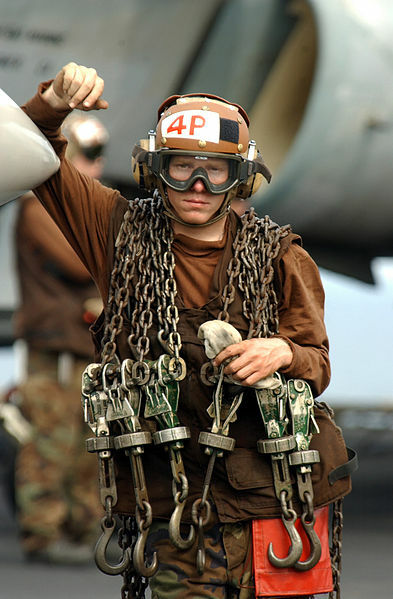 I remember the feeling I had working nights as a Brownshirt on the flightdeck. Still gives me chills when I think back on those times. I think of carrying my 16 chains and doing the 21 chain tie-downs for rough seas. I was an EA-6B Prowler Plane Captain with VAQ-132 from 1981 – 984. That time is filled with some of the best memories of my life. I am honored to have served. I was an RA5-C Brown Shirt. The most exiting, intense time of my life!.